2019-04-24 286 new PDB entries have been released on 2019-04-24. OneDep deposition service at PDBj site will be temporarily unavailable from 8:00 a.m. on Tuesday, April 30 (JST), due to system maintenance. The downtime is expected to last about 2-3 hours but may vary depending on work progress. We apologize for the inconvenience. 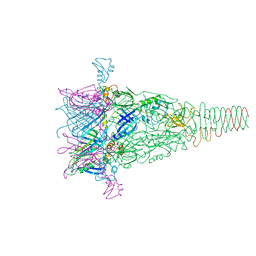 From Saturday, April 27, 2019 to Monday, May 6, 2019(JST) during Golden Week holiday in Japan, PDBj will suspend annotation processing of PDB entries. PDB deposition services continue to be available (except for temporal suspension at PDBj above).